Ignatious, more fondly known as Iggy, was less than a year old when he was separated from his parents. 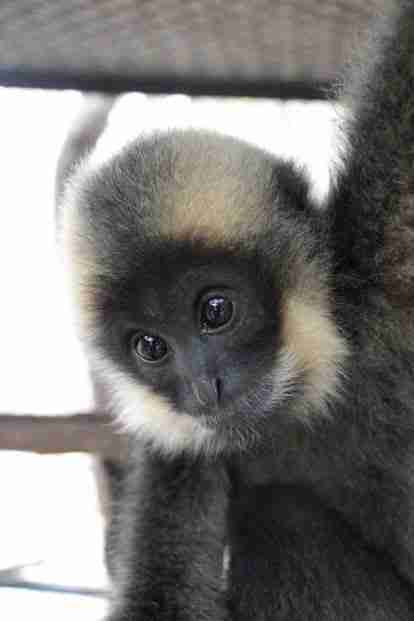 In March 2015, a master's student, who happened to be doing a thesis on gibbons in Cambodia, found him all alone in a tree. 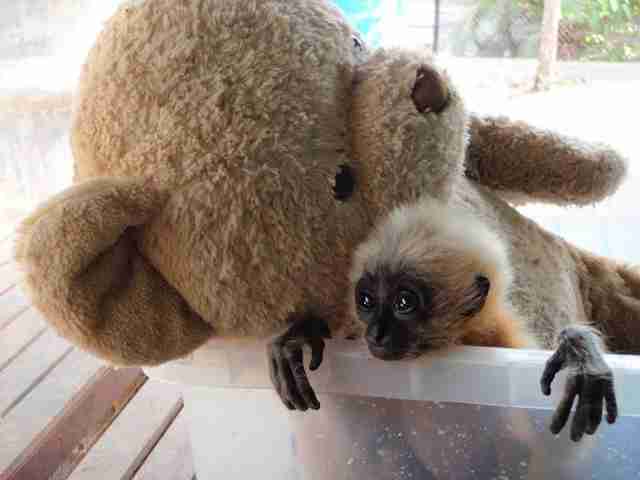 The student believed that Iggy, a golden-cheeked gibbon, had been abandoned, Nicole Leroux, a conservationist at the Phnom Tamao Wildlife Rescue Center, told The Dodo. Concerned for the young ape, the student told his supervisors about him and was told to contact the rescue center, as Iggy was far too young to be left on his own. "I am not sure why the parents would have abandoned the baby," Leroux said. 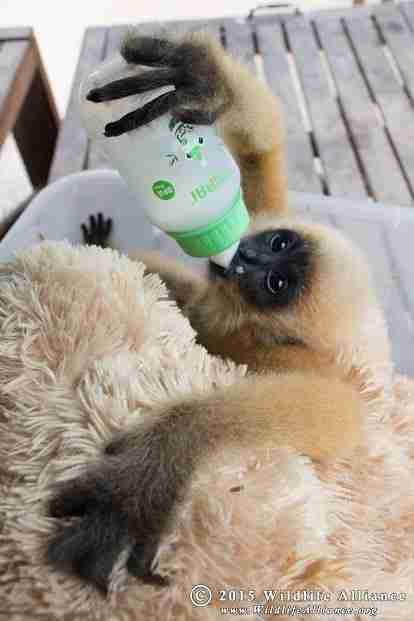 "Usually, when baby gibbons are found by themselves, it means the parents have probably been killed by poachers." 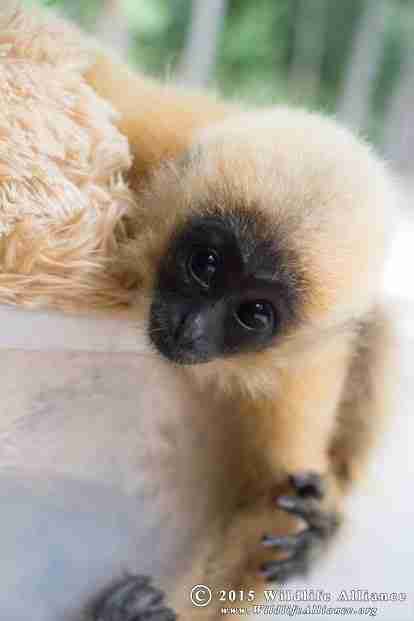 She added that gibbons typically stay with their parents until they are about 4 years old - and that gibbon parents tend to be quite protective of their offspring until they are around that age. Iggy arrived at the rescue center malnourished and dehydrated. His ribs were visible, with spots covering his stomach and chest. 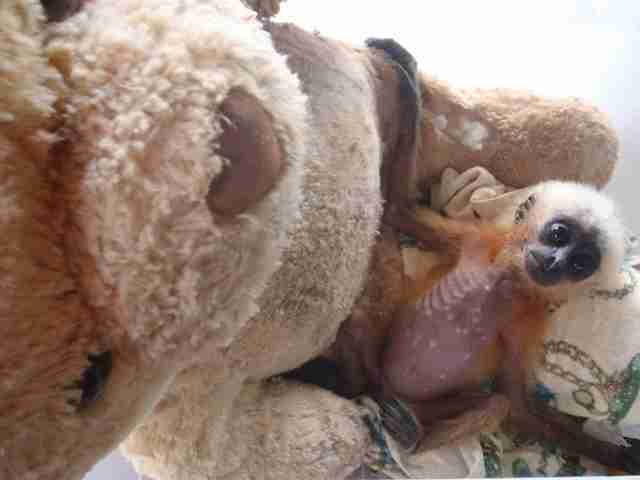 He was so weak that he could barely move, let alone hold onto the large teddy bear he was given. Instead, all he could do was rest against the stuffed animal. 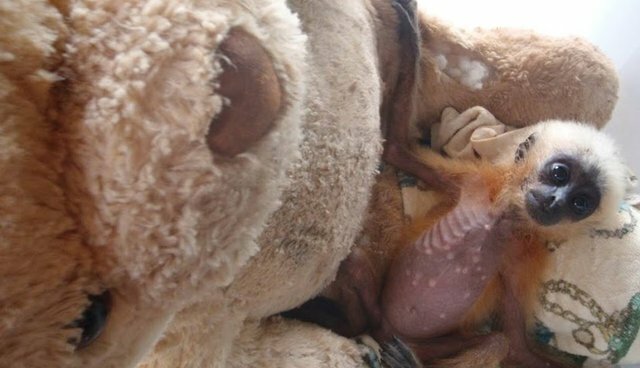 "We limit contact as much as possible so that our animals do not become too acclimated to people, so we provide our baby primates surrogate mothers in the form of teddy bears fitted with battery-operated hearts to grip onto," Leroux said. With the proper care supported by a proper diet, the mysterious spots on Iggy's body began to disappear. He gained weight and blossomed into a "cheeky" ape full of energy. Iggy is now 2 years old and one of his favorite things to do is "show off" whenever someone comes close to his enclosure - by attempting to grab whatever he spies in the person's hands. 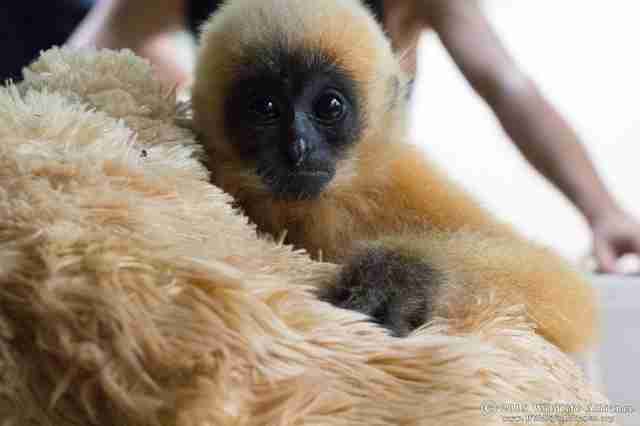 Currently, there aren't plans to release Iggy, given that golden-cheeked gibbons in the country are primarily found in northeast Cambodia, an area threatened by severe deforestation and illegal logging, Leroux said. 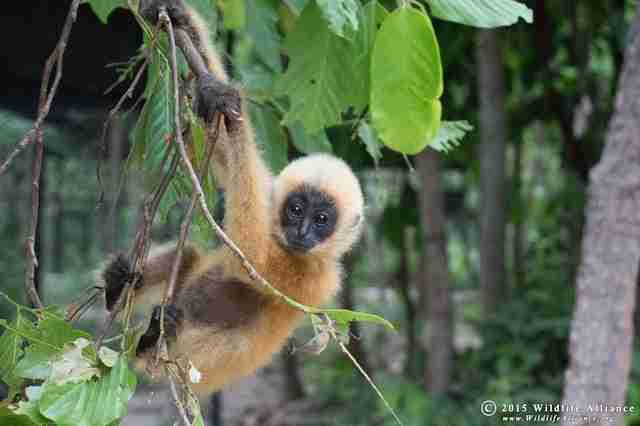 "In the future, when he is a bit larger and a bit more coordinated, we plan to introduce him to a female golden-cheeked gibbon at the center," Leroux said. "She is much older so we do not believe they will become a breeding pair. 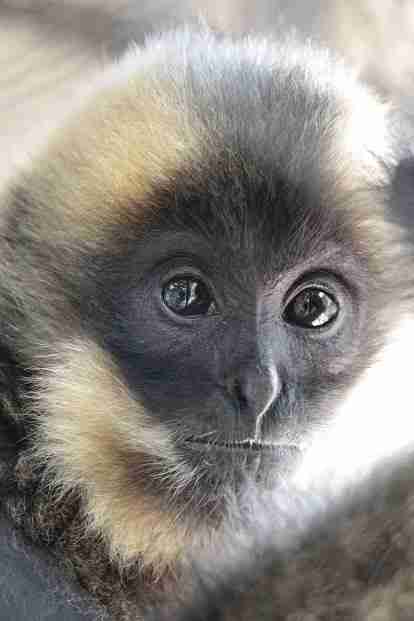 However, we would like to introduce them for companionship, as they are the only two gold-cheeked gibbons we currently have at the center," she said. Want the rescue center to continue doing good work for animals in need? Consider making a donation here.